There are several reasons to rent pressure washers instead of buying them. You don’t want to spend money on something you don’t use very often. You also don’t want to hire a professional to do what you could do yourself. Renting, however, is not as straightforward as you would hope. You need to track down vendors who actually rent out pressure washers. You need to decide what kind of pressure washer you require. Not only that, but you need to consider the cost of renting as well. Luckily for you, we already have all of those details on hand for you. Keep reading to find out everything you need to know before renting pressure washers. Anyone who owns anything will tell you that you need space to store your items. Pressure washers are no different. Many people opt to store such appliances in their garages or basements. Garages and basements, though, only have so much storage space. Consequently, a bit of thought goes into purchasing items that need to be tucked away. If you rent a pressure washer, you won’t have this problem. You can just use it and return it. Some pressure washers will run you upward of 400 dollars. Even the less expensive ones can cost you over 100 dollars. Renting is certainly a cheaper option than buying, especially if you only need the machine for one day. We do, however, have to warn you. Renting a pressure washer for several days can get pricey. Some would even say that you should just buy a pressure washer if you’ll need it for that long. Pressure washers, like all machines, require maintenance. Who, though, remembers to attend to a machine that is used so infrequently? And who can blame the people who don’t? Choosing to rent pressure washers is just so convenient. You get all of the benefits and none of the work at a low price. You can rent pressure washers at various local home improvement stores. We actually have a list of just a few vendors that you can consider. These are credible vendors and you can trust that you’ll be renting a quality pressure washer. Perhaps some of you have heard of Menards. It is a popular chain of home improvement stores. Most of the chain’s stores are located in the midwestern United States. There are, though, a few stores located outside of that region. Menards even has a “Pickup & Go Truck” for people who want their rentals shipped to them. You can find more information about this option here. Lowe’s is a more widespread chain than Menards. It has stores in the United States, Mexico, and Canada. Like Menards, Lowe’s allows customers to rent pressure washers. Unfortunately, however, the chain only offers rentals at select stores. How can you find out which stores offer rentals? By following the instructions on Lowe’s site. You’ll find that Home Depot has stores all across the United States. They sell all sorts of tools and building materials. They also rent pressure washers to customers. The company’s site lists both electric and gas pressure washers as options. You can also rent pressure washer accessories from Home Depot. The site even has a way for you to check the availability of the pressure washers and accessories they offer. We’ve already told you that renting pressure washers is cheaper than buying them. How much, though, can you expect to pay for a rental? In this section, we’ll go over the estimated costs of renting pressure washers. We’ll also discuss another, non-monetary cost of renting pressure washers. For convenience’s sake, we’ll look at the prices of renting from the retailers we mentioned earlier. We’ll start with Menards. Fortunately, the company actually has a tool rental “guide” of sorts. Menards’s power (pressure) washer rentals have a 4-hour base rate of 23 dollars. Customers must pay an “additional per hour charge” of one dollar. Home Depot’s rentals are slightly more expensive. This chain has a 4-hour base rate of 27 dollars for electric pressure washers in some areas. An entire day with your rental will run you 38 dollars. Want to know how much you’d pay for this same rental in your area? Just use Home Depot’s calculator. Lowe’s, unfortunately, does not have its pricing on its site. In any case, you can see just how inexpensive these rentals are. You’d pay much more if you were to actually buy a pressure washer. There is another cost to those who rent pressure washers. Simply put, the ways in which you can use the rentals are limited. Rentals come with guides which dictate what you can and cannot do with them. You are also liable for any damage to the rental that occurs on your watch. That said, don’t get too crazy with your rental. If you want to go all out with a pressure washer, you should probably just buy your own. We’ve gone on and on about why you should be using pressure washers. But what should you be using them for? Perhaps more importantly, why should you be using them for these things? Let’s briefly go over some of the uses of pressure washers. After all, you want to make the most of that rental. You’ll only have it for so long. Pressure washers are great to have around when you want to do some heavy-duty cleaning. So what types of things can you clean with them? Many people choose to clean the areas in front of their homes. These areas include porches and walkways. Pressure washers work well in these areas since they clean wood, concrete, brick, and metal. Some people also choose to clean their cars with pressure washers. Of course, they don’t just use any pressure washer. They choose the best pressure washers for cleaning cars. Some other great uses of pressure washers include cleaning windows, grills, and roofs. Generally speaking, you use pressure washers because you want your property to be clean. Before you rent a pressure washer, however, you should have some other things in mind. One of those things is your property’s value. As it turns out, using pressure washers can lead to a small increase in your home’s value. This information is important for people who are thinking of selling their homes. Even if you’re not selling your home, pressure washers can do you and your family some good. Pressure washers help preserve your home if you know where to use them. Thoroughly cleaning your roof, for example, will help prevent a lot of damage to it in the long run. Pressure washers also help keep your living environment safe. They help eliminate mold and any nasty bacteria that may be hiding in your home. Knowing these things before renting a pressure washer will definitely help you get the most out of the machine while you have it. There are two types of pressure washers that you can rent. One is the electric pressure washer. The other is the gas pressure washer. We’ll briefly go over these 2 different types with you. Electric pressure washers are thought of as light-duty pressure washers. They are actually suitable for cleaning your home’s interior. Unlike gas pressure washers, they don’t require fuel. For this reason, they’re a good choice for people who need something quick and efficient for light cleaning. Gas pressure washers are typically medium-duty or heavy-duty. As a result, they’re usually used for outdoor cleaning. As their name might suggest, they require fuel to operate. When you rent gas pressure washers, you’ll be provided with fuel as well. Note that heavy-duty gas pressure washers are often used for commercial cleaning. You’re unlikely to actually need a heavy-duty gas pressure washer for most tasks. 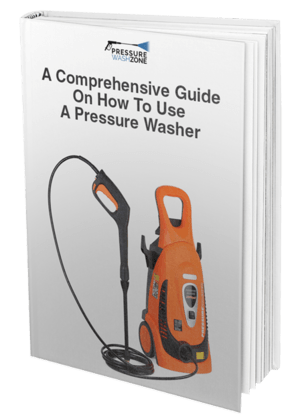 Want to know more about electric and gas pressure washers? We already have a piece dedicated to the topic, so read away. There are also various accessories available to you. You can, for instance, rent pressure washer hoses and pick from a vast array of soaps. Keep this information in mind when dealing with your vendor of choice. You’ll find reviews of pressure washers all over our site. We trust the brands that we highlight here on our site. That said, we’d like to share a couple of those brands with you. We believe that doing so will help you pick quality rentals. The PowerStroke is a rather expensive model. The Amazon list price is almost 450 dollars. Fortunately, we’re talking about rentals here. Having said as much, this brand is definitely worth the rent if you can find it. If you want to know more about this pressure washer, check out our in-depth review of it. The Ryobi is another one of the pressure washers we’ve reviewed. We’ve included it here because it is a cheaper alternative to more expensive electric pressure washers. Its list price on Amazon is 115 dollars. The machine is refurbished, but it’s highly recommended by users. As with our last recommendation, we have a lengthier review of it elsewhere on our site. You can take a look at it here. We know that there is a lot of information to digest here. From the costs to the brands, we really tried to drop all of the knowledge we could spare. So if you want to rent pressure washers in the future? Well, you can’t say we didn’t school you. And if you’re ever itching to know more about pressure washers? Don’t be afraid to use our contact information.